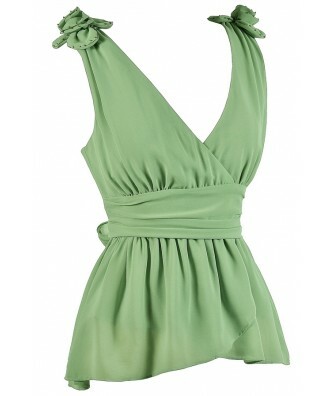 You have added Sweet As a Rosette Top in Mint Sage into shopping cart. If you're looking for the perfect top to add to your summer wardrobe, consider this adorable top with a beaded fabric rosette detail on each shoulder. The Sweet As A Rosette Top is fully lined and made of chiffon. It has a crossover surplice neckline and a banded waist that continues around the back, forming a sash that can be tied into a bow. A hidden side zipper completes this top. The Sweet As A Rosette Top is the perfect addition to your wardrobe, because it makes such a big impact without any effort. Pair this top with denim skinnies and heels for a night out. The Cream version also looks fantastic worn with black skinnies for a contrasting look. Details: Fully lined. Hidden side zipper. 100% polyester. Hand wash cold water with like colors. No bleach. Hang dry. Small measurements: Length from top of shoulder to hemline: 23-26". Bust: 32". 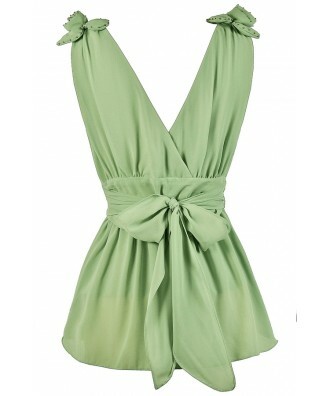 You have added Sweet As a Rosette Top in Mint Sage into Wishlist. 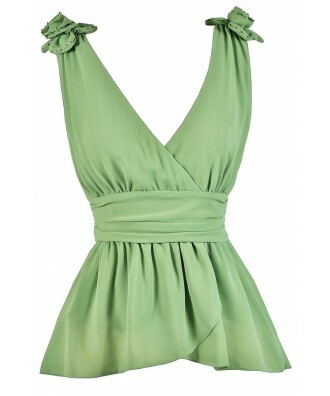 You have added Sweet As a Rosette Top in Mint Sage for Stock Notification. You have set Sweet As a Rosette Top in Mint Sage as a loved product. You have removed Sweet As a Rosette Top in Mint Sage as a loved product.